Physiological signals or biosignals are electrical, chemical, or mechanical signals that created by biological events such as a beating heart or a contracting muscle producing signals that can be measured and analyzed. These signals are generated from the metabolic activities of human internal organs. Therefore, in certain conditions, physiological signals have different pattern between healthy and unhealthy individuals. Based on this information, generally, physicians take some action and treat their patients. 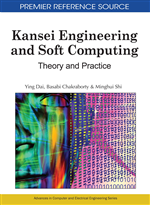 However, utilizing physiological signals is a new approach in Kansei engineering research fields for coping with human sensitivity. This study focuses on the possibility of physiological signal application in Kansei engineering. Biosignals are signals that are created by biological events such as a beating heart or a contracting muscle. The electrical, chemical or mechanical activities that occur during these biological events often produce a signal that can be measured and analyzed (Escabi, 2005). Therefore, biosignals might contain useful information that can be used to understand the relation between biological event and human feeling or perception. Biosignals can be classified according to various characteristics of those signals; including the waveform shape, statistical structure, and temporal properties. Signals are first detected in a biological medium such as cell or on the skin’s surface using a sensor. The sensor converts the physical measurand into an electric output and provides an interface between biological systems and electrical recording instruments. The type of biosignal determines what type of sensor will be used. ECGs, for example, are measured with electrodes that have a silver/silver chloride (Ag/AgCl) interface attached to the body that detects the movement of ions. It is very important that the sensor used to detect the biosignal of interest does not adversely affect the properties and characteristics of the signal being measured. After the biosignal has been detected with an appropriate sensor, it is usually amplified and filtered. Operational amplifiers are electronic circuits that are used primarily to increase the amplitude or size of a biosignals. Bioelectric signals, for instance, are often minute and require up to a thousand-fold boosting of their amplitude. An analog filter may then be used to remove noise or to compensate for distortions caused by the sensor. Analog-to-digital (A/D) converters are then used to transform biosignals from continuous analog waveforms to digital sequences. An A/D converter is a computer controller voltmeter, which measures an input analog signal and gives a numeric representation of the signal as its output. The analog waveform, originally detected by the sensor and subsequently amplified and filtered, is a continuous signal. The A/D converters transform the continuous analog signals into discrete digital signals. The discrete signals consist of a sequence of numbers that can easily be stored and processed on a digital computer. A/D conversion is particularly important in that, due to advances in computer technology, the storage and analysis of Biosignals is becoming increasingly computer based. Nerve and muscle cells generate bioelectric signals which result from electrochemical changes within and between cells. If a nerve or muscle cell is stimulated by a stimulus that is strong enough to reach a necessary threshold, the cell will generate an action potential. The action potential, which represents a brief flow of ions across the cell membrane, can be measured with intracellular or extracellular electrodes. Action potentials generated by an excited cell can be transmitted from one cell to adjacent cells via its axon. When many cells become activated, an electric field is generated which propagates through the biological tissue. These changes in extracellular potential can be measured by means of surface electrodes. The electrocardiogram (ECG), electroencephalogram (EEG), and electromyogram (EMG) are all examples of this phenomenon. Different organs, including the heart, brain, and lungs, also generate weak magnetic fields which can be measured with magnetic sensors. Typically, the strength of the magnetic field is much weaker than the corresponding physiological bioelectric signals. Biomagnetism is the measurement of the magnetic signals which are associated with specific physiological activity and are typically linked to an accompanying electric field from a specific tissue or an organ. With the aid of very precise magnetic sensors or SQUID magnetometers it is possible to directly monitor magnetic activity from the brain, peripheral nerves, and the heart.